Nokia Siemens Networks is launching a video optimization solution that combines its Flexi Content Optimizer, policy management and new real-time congestion awareness. The Flexi Content Optimizer adjusts video content and re-scales video streaming to match the smartphone screen size. The company calculates the solution can reduce radio network loading by up to 25% while delivering the highest quality video to each user's device. Real-time congestion awareness enables the network to react instantly when a base station becomes heavily loaded. Video optimization then ensures that the operator’s most valuable subscribers in a specific location enjoy the best video quality. “More people than ever are using video streaming applications on their smartphones. According to Informa Telecoms and Media, video streaming will account for a third of mobile data traffic on mobile handsets in 2016**,” said Antti Romppanen, head of packet core product management, Nokia Siemens Networks. “This translates into a lot of video. By bringing together our capabilities for best ever video, operators can ensure that subscribers have a smooth viewing experience even during congested busy hours." The Global Hack for Good, which is organized by Refugees United, is planning a series of "hackathons" - a weekend-long marathon of developing applications on mobile networks - to be held on three continents, on three separate weekends, but all are working toward the same goal of making re-connection easier. 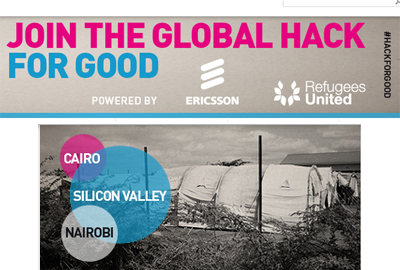 Ericsson is backing the effort. 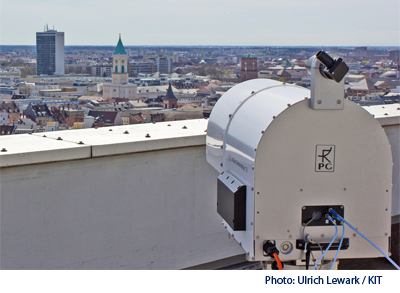 Researchers at the Fraunhofer Institute for Applied Solid State Physics and the Karlsruhe Institute for Technology achieved 40 Gbps line-of-sight wireless transmission over a distance of 1 km using the 240 GHz spectrum band. Under project "Millilink," the researchers developed electronic transmitters and receivers measuring 4 x 1.5 mm2 using semiconductor technology with high carrier mobility (HEMT), makes it possible to use the frequency between 200 and 280 GHz. The researchers said the atmosphere shows low attenuation in this frequency range, which enables broadband directional radio links. The wireless transmission system was tested between two tall buildings in Karlsruhe. Alteryx announced $12 million in financing from Toba Capital (recently formed by Vinny Smith, former CEO and founder of Quest Software) and existing investor, SAP Ventures for its analytics platform. 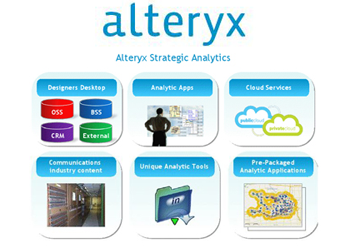 Alteryx Strategic Analytics 8.5 includes significant enhancements such as social media tools for analytics, the first native creation of the Tableau Data Extract, advanced interactive mapping, and a new designer interface specifically designed for line-of-business analysts. "Alteryx is enabling our customers to Humanize Big Data and answer the critical business questions that can accelerate their growth," said Dean Stoecker, chairman and chief executive officer at Alteryx. "But to find these answers, business analysts need better tools than spreadsheets and other technologies created decades ago. Alteryx puts affordable, powerful big data analysis tools in the hands of analysts, and our solutions facilitate complex tasks and the ability to obtain insights from diverse data sets that were once thought impossible to achieve." Sony Electronics launched an integrated marketing campaign in conjunction with commercial shipments of its first 4K Ultra HD TVs in the United States. 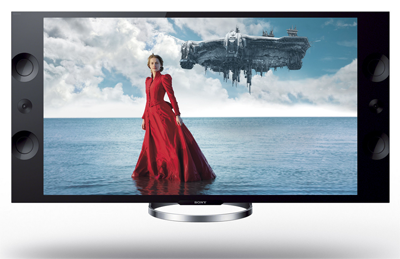 Images have a resolution of four-times that of Full HD TV (3840 x 2160 pixels). "The campaign calls out the enhanced quality of anything one would watch on a Sony 4K TV with a picture that is four times clearer than full HD," said Patrick Bewley, vice president of Brand Experience & Visual Design at Sony Electronics. "It's the highest resolution, most immersive experience Sony has ever created, and in order to experience it, you must see it in person to believe it." Dell will enable Microsoft Windows Server Hyper-V as a viable hypervisor choice for the OpenStack cloud platform. Specifically, Dell will enable key features of the Windows Server 2012 virtualization platform for OpenStack, including network virtualization, policy-based isolation, Quality of Service (QoS) and multi-tenancy. Dell said it is working with other OpenStack members for the optimization of OpenStack components including OpenStack Compute for Hyper-V, OpenStack Block Storage for Windows, and Dell Crowbar provisioning. Dell is targeting availability of initial functionality in an upcoming release of the OpenStack project. More than 100 hours of video are being uploaded to YouTube every minute. YouTube also confirmed more than one billion users are coming to the site every month. May 20th marks the 8th anniversary of YouTube. The U.S. General Services Administration (GSA) issued a request for information (RFI) calling for stakeholders' input to make our the federal government's cybersecurity more resilient. The GSA is looking for recommendations on standardizing cybersecurity contract elements and procurement requirements. Stakeholder input will contribute to the final recommendations report to be issued in the early summer. "Collaboration and cooperation allows government to deliver critical services to our federal partners and most importantly, the American people," said GSA Acting Administrator Dan Tangherlini. "The RFI is an important first step to a public private partnership that will help secure our nation's infrastructure. Developing these cybersecurity procurement recommendations is a priority for GSA and the interagency working group." The launch of Intel-based Ivy Bridge server platforms in the latter half of 2013, bringing an opportunity and value proposition for users to upgrade their servers and incorporate 10GbE networking. 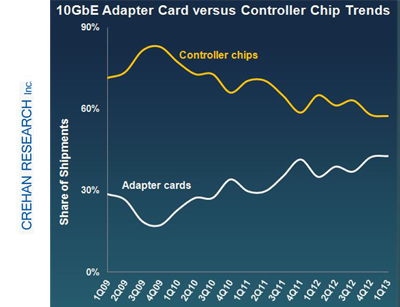 "Reductions in 10GbE server adapter inventories and prices, broader product offerings and the launch of the new Ivy Bridge server platforms should drive increased 10GbE server networking growth," said Seamus Crehan, president of Crehan Research. "This could be further accentuated by the backdrop of an expected improvement in the IT spending environment, more of which seems to be shifting toward the data center," Crehan added. The research is published in a newly-released 1Q13 Server-Class Adapter & LAN-on-Motherboard (LOM) Report. 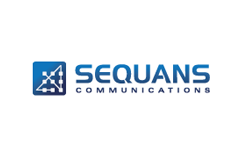 Sequans Communications introduced a new line of "EZLinkLTE" LTE modules based on its own LTE baseband chip. The modules include a complete RF front end and key interfaces in a single, compact package. The first EZLinkLTE module, sampling now, is the VZ20Q, which is one of the first modules in the industry to support both LTE bands 4 and 13. The baseband chip at the heart of the new module is Sequans’ SQN3120 Mont Blanc chip that was certified by Verizon Wireless in 2012. The chip is compliant with 3GPP release 9 and it delivers category 4 throughput of up to 150 Mbps in the downlink. Starting with the SQN3120 chip, the VZ20Q integrates all other elements necessary for a complete LTE modem system. These include an LTE-optimized RF transceiver provided by Sequans’ RF partner, Fujitsu Semiconductor, a complete dual-band RF front-end for bands 4 and 13, LP-DDR SDRAM, embedded boot Flash, and VC-TCXO, all in a single, surface-mountable package with a very compact footprint, 17 x 24 x 2 mm. 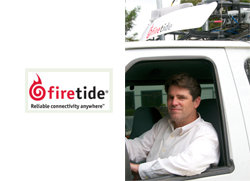 Firetide, which specializes in wireless mesh networking, named John McCool as president and CEO. McCool comes to Firetide from Cisco, where he was CTO and SVP of Cisco’s Global Enterprise Segment and led the "borderless networks" initiative, which accounted for one-third of Cisco’s $46 billion sales in fiscal 2012. Firetide said it is experiencing exploding demand for its advanced wireless networking technology, which can be used in applications ranging from video surveillance to the emerging sensor-based networks known as the "Internet of Things." Larissa Herda, tw telecom Chairman, CEO and President, has been named to lead the FCC's Communications, Security, Reliability and Interoperability Council (CSRIC). Her appointment is for the next two years. Ms. Herda is currently a member of President Obama's National Security Telecommunications Advisory Council (NSTAC), which provides the President with critical advice and recommendations regarding national security, cyber security and emergency preparedness. Tellabs announced the resignation of Andrew B. Szafran, executive vice president and chief financial officer. The company said the decision was for personal reasons unrelated to Tellabs operations, financial reporting or business outlook. 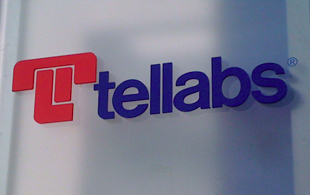 Tom Minichiello, Tellabs vice president, finance and chief accounting officer, will serve as acting CFO.